We’re 15 minutes’ walk from St. Peter’s Cathedral. Located in the heart of Rome (Trastevere) this women-only hostel is set in a 16th-century ex-convent inside the International Women's House (Casa Internazionale delle Donne). We offer beds in dorms or private rooms. All the rooms are very large and quiet and overlook the inner garden or the typical red rooftops. Each room features ceiling fans and include linen. The living room features a kitchen corner and a fridge for the guests' use. Our amenities include free Internet and Wi-Fi (in the garden as wel)l , free hot showers, 10 toilets, a wash-and-dry service and a book exchange/library. We also have maps and tourist information and can help you with museum reservations. 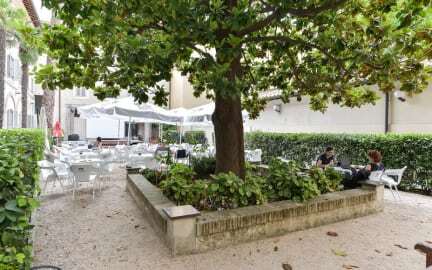 Orsa Maggiore is located in a quiet and relaxing spot in the very centre of Rome. Our characteristic neighbourhood, Trastevere, is one of the attractions of ancient Rome, full of cinemas, theatres, bars, small restaurants and artisan shops; hence, it’s an ideal spot for a taste of everyday city life. We’re also just a few minutes’ walk from Piazza Navona, Campo dei Fiori, Synagogue, Gianicolo Hill and the Botanical Gardens. Please note that this hostel is only for female guests. Read our Things to Note below before making a booking. You are welcome to leave your luggage here if your bed is not yet ready when you check in. Please provide your own padlock to lock your locker. We inform you that we preauthorize your credit card. Payment is due upon arrival by cash only, please. Please note that rates do not include a city tax of €3,50 per person per night. We have a 72hr cancellation policy. Late cancellations, late changes and no-shows shall be charged the equivalent of the first night’s accommodation. Cancellations must be made via fax or email; phone cancellations will not be considered. We do not send or fax letters for visa document applications to embassies and/or consulates. Wonderful place, relaxen atmosphere and very kind and helpful staff! I can really recommend this hostel if you want to have a tremendous stay in the center of Rome. Very nice hostel! Great place, with an interesting history. Facilities are very good; big rooms, clean bathrooms. The location is ok, quite close to the Vatican. Very nice hostel but really hard to meet new people. People where a little bit old and there was not a very nice hang out spot with televison or something. Very clean and nice place, very friendly staff! I had a nice stay at Orsa Maggiore. The room was huge, with a comfortable bed, closet, table, chair and nightstand. The only weird thing was that it was advertised as a 5-person room but they added an extra bed during my stay. However, the room was big enough so no problem. The showers, bathrooms and kitchen were clean and adequate. There were nice couches to relax in and it was lovely to sit in the courtyard and enjoy the sun. Excellent value for money! We offer a daily cleaning, huge and bright dorms, and staff who speak English, French and Spanish between them.